The AMD Radeon Pro 560X is a mobile graphics card based on the small Polaris 21 chip from AMD. It is an option for the 15-inch Apple MacBook Pro 2018 and is very similar to the Radeon Pro 460. Compared to the Radeon Pro 560 from the 2017 MBP15, the 560X is slightly higher clocked. The Radeon Pro 555X from the entry level model offers less cores. The mobile Radeon Pro 560X should support all features of the desktop RX 460/560 like DisplayPort 1.2 (Polaris actually supports up to 1.4), HDMI 2.0 (via USB-C adapter), new H.265 video de- and encoder as well as architectural improvements. More information about the Polaris architecture is available in our dedicated review. 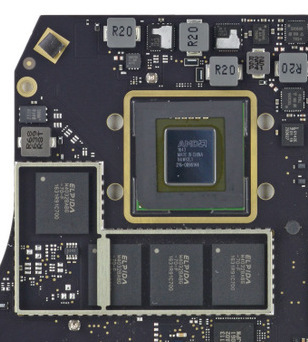 The Polaris 21 chip is manufactured in a slightly improved 14nm FinFET process according to AMD. The power consumption of the Radeon Pro 460 is 35 Watts according to AMD, so this should also be the case for the Pro 560X.